Starting a business while in high school may seem daunting, but sophomores Madison Larson and Leigha Torney have found a way to make it happen. Along with her school life, Madison Larson makes and sells jewelry for her online business, Madi + Grae. Though they did not narrow it down to jewelry instantly, Larson and her grandma had been discussing about starting a business for a couple of years. All thoughts became a reality when Larson and her grandma found the motivation to start their business. “Just one night I was like ‘let’s do this.’ So we got into Etsy and signed up,” said Larson. Over the past two years, Larson has seen her business grow from a dream to a reality and is happy that she started the business. “Looking back, I’m really glad that I made [the] decision [to open an online store],” said Larson. On Thursday, Aug. 30, sophomore Leigha Torney holds one of her pieces of work that she sells as a part of her business. 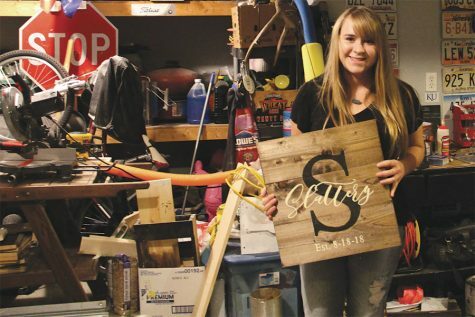 Like Larson, sophomore Leigha Torney has transformed her passion into a source of income, profiting off of handmade pieces of furniture and home decor. Inspired by the television show “Fixer Upper,” Torney wanted to decorate her room in the same farmhouse style seen on the show, but all of the furniture was too expensive for her. Instead of giving up on the idea of redecorating, Torney decided to make some pieces of her own. It was not much longer before she was inspired to turn her hobby into an online business, Rustic Design by Leigha. “I realized that it’s not that expensive to sell stuff, so I started building more stuff and posted it on Facebook and it blew up,” Torney said. Now Torney sells a variety of home decor items in the same farmhouse style that inspired her, and hopes to see Rustic Design by Leigha continue into the future. “I would like to run a business of home renovations and building furniture for people as a career, so I’m hoping my business will continue on for a while,” Torney said. Working as a teacher in the day and running a business in the afternoon, art teacher Jodi Ellis and long term substitute teacher Gretchen Aerni have hectic schedules. Being a creative person, Aerni’s drive to start her business, Spot On Apparel, did not take long to come together. When her kids were younger, her husband coached baseball teams and the two were always looking for T-shirts. One day, while visiting her brother-in-law, Ron, to order tees, he suggested that they should start their own company. Leaving her car on Monday, Sept. 3, long term substitute teacher Gretchen Aerni drops off a box of t-shirts at the school. “When I ordered a $20 [tee] from a dance studio for my oldest, who was 8 [years-old], and it fit our 2-year-old, I decided it was time for us to start [a company],” said Aerni via email. Aerni says the goal of the business to “provide spirit wear and apparel that is ‘spot on’” for their customers. Running a business is not without its challenges. Aerni admits that her company requires lots of forethought and attention to detail to create quality products. “The screenprinting business is a ‘Murphy’s Law’ business. If something can go wrong, it probably will. People have no idea how much goes into it. Then add in the fact that I personally don’t do the art or printing, so that adds two more huge factors whose productivity is out of my control,” said Aerni. With many years to come, Aerni hopes that Spot On Apparel can go beyond profits and make a positive impact on the community. “A dream of mine is to pair up with either customers, groups or businesses to provide [donated tees] to either a staff or student body in a low-income school [each month],” said Aerni. 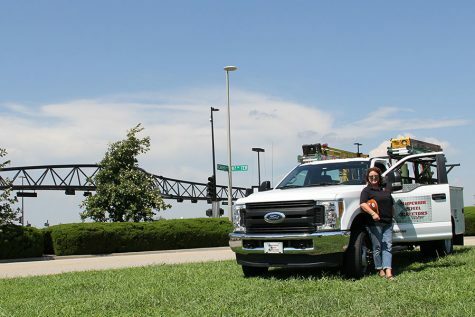 Standing near the stoplight and her company’s work truck on Saturday, Sept. 1, art teacher Jodi Ellis displays one of her company’s, Superior Steel Erectors, many works. “Had I known a lot of other stuff about this I probably would’ve been a little more concerned about doing that,” Ellis said. Ellis and her husband Monty’s business, Superior Steel Erectors, can be credited for constructing a number of steel structures throughout the area. One of the business’s first big jobs was the Lenexa Signal Truss on 87th and Renner. Taking the first step and initiating the project was very intimidating for the Ellis’. Owning a business may have been scary to start, but Ellis credits the ability to take risks for her business’s ultimate success.